As you’ll likely recall, one such event came in June 2016 when Antifa showed up at a rally in Sacramento and began violently attacking protestors with canes and knives. Of course, with the whole thing caught on video, it’s pretty clear who the instigators of violence were (see our post here). At the Sacramento rally, antifa protesters came looking for violence, and “engaged in several activities indicating proficiency in pre-operational planning, to include organizing carpools to travel from different locations, raising bail money in preparation for arrests, counter-surveilling law enforcement using three-man scout teams, using handheld radios for communication, and coordinating the event via social media,”the DHS report said. Of course, it’s not just California. 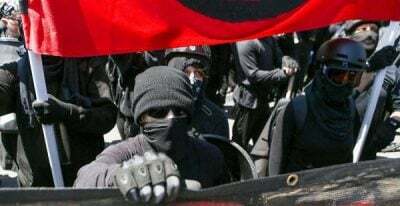 As the FBI and DHS note, the Antifa group operates much like terrorist cells with disconnected groups all over the country. Alas, we suspect you’ll hear precisely nothing about any of this on CNN.